The O Alliance is a new consulting model that leverages a network of transformational practitioners with expertise in all of the critical areas that will unlock value and empower a retailer—digital/technology, store operations, change management, marketing and talent. Designed to align a retailer’s organizational practices with today’s digitally savvy consumer, The O Alliance’s holistic approach delivers customer-focused strategy and solution-driven execution that creates a circular shopping ecosystem. The store is far from dead, but for most retailers, it’s gasping. While the majority of retail sales still occur at the physical store, online transactions are escalating, with purchases made via mobile, tablets, desktops and other connected devices projected to increase by 60% to $125 billion annually by 2018, according to a recent report by Juniper Research1. At this rate, the retail industry soon will be a world of 50:50. Fifty percent of retail sales taking place online, while the other half − a very significant reduction − will derive from brick-and-mortar. Sound implausible? While many take solace in reports which show on-line commerce under 10% of revenues, these reports include behemoth Wal-Mart, and may be presenting a misrepresentation of the reality of the escalation-particularly for specialty stores, brands and chain stores. 50:50 will happen. And retail CEO’s and their Boards must take note and actions on the dynamic shift, as this mix of revenue, changes the entire economic model of retail permanently. This is something much bigger than omni-channel. Why are we so certain of the new world of 50:50? Because some retailers already have achieved or are approaching this 50:50 model. Williams-Sonoma announced in its 2Q15 results2, that net e-commerce revenues generated 51% of total company net revenues. As of January 2015, J. Crew saw 32% of total revenues take place online (while it struggles in stores), according to eMarketer3. In the same January-to-January period, all three Urban Outfitters brands (Urban Outfitters, Anthropologie and Free People) saw nearly 30% of total revenues come from e-commerce. At Land’s End − no surprise − nearly 85% of total revenues were generated online. For Neiman Marcus, 24% of sales in 2014 were transacted online, according to the company’s August 2015 Form S-1 filing4. If these traditional retailers are already seeing a 30:70 mix of online-to-stores sales, with even more dramatic redistribution for those with strong historic catalog revenues, can a world of 50:50 be that improbable? The progression is well underway and cannot be ignored. The shift should concern any retail maven, as the rapid escalation of digital is not driving total growth and with digital expansion, new cost structures are become part of the Selling, General & Administrative (SG&A). As the 50:50 disruption becomes reality, can stores survive? Could they even play a critical part in reviving the industry? This white paper answers these critical questions. It describes how stores can thrive as a vital part of the new digitally-enabled retail world of 50:50, and even be differentiators during this age of disruption. Retail leaders are challenged to take actions similar to the real-world examples this paper describes. It will look at the anatomies of the strategies unfolding at retail winners such as Williams-Sonoma, Restoration Hardware and Neiman Marcus − customer-centric leaders that are melding online and offline retail into Seamless Circular Commerce experiences. All three, and others like them, are significantly less focused on channel-driven solutions. They have intelligently placed the customer at the center of commerce creation, and by utilizing deep databases, have leveraged this “data currency” to truly understand consumer activities, and preferences. This data allows them to connect all their key touch points and to then link digital, social, mobile, stores, inventory, logistics, training and other disciplines that impact the customer experience. There is no channel-focus here! The real retail winners treasure the store experience and have invested in it. Their physical environments and sales associates deliver high-touch customer interactions which are informed, exciting, connected and highly productive. In addition, retail winners increasingly are investing in store-related technologies, from mobile payment for ease of customer check-out, to geolocation to recommend nearby stores to RFID, at the article level, to maximize inventory productivity and provide well executed click-and-collect strategies. There is a focus on store productivity measurement and rich content training tools, all delivered on mobile devices. But if stores are dying, why are these retailers investing in their stores? Retail winners share a common theme: Their approach is customer centric, not channel focused. These retailers have recognized the diminishing retail economics of a digital and technology strategy which is not connected to an in-store customer experience. They utilize technology as an enabler of customer and store experience. And they know that a multi-channel customer is significantly more valuable than one that is pure e-commerce. They are demonstrating that high-value activities, in brilliantly executed stores, bring a brand to life and are at the core of future success. These retailers will thrive in the upcoming world of 50:50. These reinvented store experiences − the antithesis of many cookie-cutter chains, which lack community connectivity and the attention to detail − are at the heart of the personalized customer experience which create the most productive transactions, strongest loyalty and sustains long-term economic health. Preparing for 50:50 is not complicated, but it is a paradigm shift. Read on to learn how retail winners are turning their stores into a powerful engagement tool, and how − with Seamless Circular Commerce − you can, too. Digitally connected and well executed store experiences are at the core of future success. So why is a pure “omni-channel” approach failing to prepare the industry for the new world of 50:50? The origin of these failures, lie in a pattern of rapid store-count growth of banal boxes, chronic underinvestment in the physical store; store staffs which are poorly selected and trained; a rapid escalation of an internal no-win e-commerce market share game; and lack of inventory accuracy, insight and distribution. All this has turned many stores from selling and service locations into mini-distribution centers in a push to optimize inventory. Some retailers have gone so far as to make unwise capital investments in new, high-profile technology “bells and whistles” in a misguided attempt to attract, engage and grow customer loyalty. In the end, the customer did not value the innovation…..and these efforts mis-fired. Why are many specialty retailers, whose stores once profitably exploded across the country, now closing stores? Many simply blame the shift to e-commerce. But most expanded their cookie-cutter store formats, fueled by baby-boomer consumption, without much regard to retail excellence. Their expansions often were encouraged by investors focused on growth through additional units, not on enhancing and improving the in-store productivity model. Many, including Ann Taylor and Gap, had great legacies as true specialty stores but lost their distinction during this expansion − and became simply chains. Mediocre became the norm. Customer service became self-service, visual merchandising became tables piled with cheap imports, and shop windows were filled with posters, often shouting deep discounts. The essence of retail is theater. -Tom Peters, author of The Pursuit of Wow, The Circle of Innovation and In Search of Excellence. The art of retail was lost in translation. These uninspired formats expanded until America had the highest level of retail square footage per capita in the world. Just prior to the mass adoption of e-commerce, American retailers had produced enough retail space “to divvy up 46 square feet of it for every man, woman and child in the U.S,” stated Robin Lewis, in a Forbes commentary7, “along with more ‘stuff’ jammed into that space than anyone would ever need in a lifetime.” By comparison, the UK, with the second highest retail square footage per capita, only has about nine square feet of retail space per capita, he reported. Retailers kept building, although location level productivity had been diminishing for years. Stores were built to the minimum level of return on investment. But then the music stopped. First retail websites on the internet captured traffic, but when the explosion of mobile brought all this plethora of store space into a single digital access point, a new reality took hold. Consumers gained control; and high-content mobile sites, efficient marketplaces with expedited shipping, and uniquely curated online shopping experiences and subscription services kicked off. Bland, overbuilt specialty stores were ill-prepared to respond. Today many retailers are laden with long-term leases, legacy systems and anemic, belated approaches to customer-centricity. Retailers desperate to survive, expedited cost containment, leaving many stores with poor staffing and training was almost non-existent. IT and marketing departments were burdened with leading the e-commerce business surge − often without a holistic, customer-centered strategy anchored at the core. In this shift from stores to the Internet and the rush to chase online revenue, many retailer executives have ignored and under-appreciated the physical store asset. Now they’re discovering that several competitive online promotional features such as free shipping − fast becoming a consumer expectation − present an escalating cost structure. Growing customer demand for free returns brings another unanticipated outlay. And customer acquisition costs are escalating in the digital space. In the end, spiraling e-commerce expenses − when added to customer acquisition and contact strategies costs, and platform and marketing investments − are exceeding the cost of store labor and occupancy. Do Consumers Still Want An In-store Experience? The evidence is there that customers, even the most digitally savvy, still enjoy a great store. The fact remains that when online, 24-hour purchasing isn’t in play, most consumers still desire the in-store experience of exploration, discovery, touching, feeling, trying and learning about merchandise from a knowledgeable, well-trained sales staff. Digital interactions are expected to influence 64 cents of every dollar spent in retail stores by the end of 2015, or $2.2 trillion, according to a May 2015 press release9 from Deloitte Digital. This figure has grown considerably from 14 cents of each dollar spent in brick-and-mortar stores just three years ago. Deloitte Digital has also identified a growing digital divide in which consumers’ digital behaviors and retailers’ ability to deliver on those consumer expectations continue to diverge. While 85% of consumers prefer to shop in-store, nearly 20 million square feet of retail space went dark in the first seven months of 2015. Aeropostale, American Apparel, Ann Taylor, Body Central/Body Shop, C. Wonder, Chico’s, Deb Shop, Delia’s, Dots/Simply Fashion, Gap/Gap Kids, Guess, Izod, J.C.Penney, Jones New York, Kate Spade, Kmart, Macy’s, Sears, Sony Canada, Target Canada, Walgreens and Wet Seal are among those that closed stores or went bankrupt in 2015. While the reasons behind each company’s closure case may have nuances, most had common themes of over-expansion, growing online competition, declining traffic, and years of underinvestment in the physical store − because retailers failed to recognize what consumers really want in a store experience. And some of these same retailers have spent massively in technologies to improve digital experiences, omni-channel experiences, mobile platforms and social media. Many have focused on their newest talent titles…. Chief Digital Officer, Chief Engagement Officer and other omni-channel leaders, but few are really preparing for the important role their stores can play in the world of 50:50. Initially most retail executives saw online sales as incremental, while others viewed e-commerce as a true growth engine. Still others simply saw an evolutionary shift from one channel to another, driven by the customer’s acceptance of online marketplaces and their ease of shopping. Still others considered the erosion of store traffic and the growth of digital as a marketing or generational sea change. ￼Few retailers have taken the proactive steps to advance the very thing a digital business is challenged to deliver….a great physical store experience. When Amazon.com took a stand, most retailers felt the threat; they responded by escalating e-commerce activities, following their competitors into the digital and social media universe. But surprisingly few took proactive steps to advance the very thing a digital business is challenged to deliver….a great physical store experience. Perhaps no one expected e-commerce to become a market share game within their own companies, nor considered the unique cost structures of each business model. When omni-channel efforts finally got underway, generally they were defensive, channel-specific strategies. Today many of these efforts are at best designed to link digital sales to the store inventory only, without addressing the actual store and customer experience. An ominous reality looms. There is a divergent economic model between the operations of a store-centered company and an e-commerce/direct-to-consumer business. The profit and loss structure of the old-fashioned store is more robust than a direct-to-consumer business. Key performance indicators (KPI’s) such as conversion, average transaction, units per transaction and the basic cost of customer acquisition vary widely between the two models…and all point to greater economic potential in a store experience than one purely online. Escalating costs of digital marketing and content production; incremental organization headcount to support separate lines of business; and growing logistics costs and capital investment in technology are now weighing heavily on retail organizations. The seismic shift from bricks-to-clicks places significant pressure on the fundamental metrics of a retail business. Just as a retailer rigorously pursues more digital transactions, the retailer unwittingly is shifting to a less profitable model. Consider that few of today’s publically traded retailers with robust growth in e-commerce are reporting e-commerce as a separate segment. Many include ecommerce revenues in comparable store sales. But, if in-store traffic is down, as has been the case for several years, then true comparable brick-and-mortar store sales must be down. The reported comp, which includes the online sales, is therefore reflecting a shift to a less productive business model. Businesses showing little top-line growth, but experiencing rapid ramp up of digital, validate the shift underway to the world of 50:50. “Online is shifting sales out of stores, with serious impacts on ROIC,” Sajal Kohli, director of corporate operations for McKinsey, said at a recent Shop.org14 conference. McKinsey estimated that a 5% shift of sales out of stores equaled a 30% decline in ROIC, he said. The seismic shift from bricks-to-clicks is placing significant pressure on the fundamental metrics of a retail business. As it rigorously pursues more digital transactions, the retail universe unwittingly is shifting to a less profitable model. And while retailers are ranked by benchmarking and research agencies, such as L2 and Forrester Research as omnichannel “geniuses”, top line and bottom line results are eluding many of these companies. Most retailers are treading water, simply attempting to control Selling, General and Administrative expenses. Eventually this balancing act will become harder to achieve and ultimately will reach a tipping point: That’s when the reality of 50:50 will hit, and hit hard for many. Retail executives and their Boards are feeling trapped: If the consumer is going digital and abandoning stores, what else can they do but expand digital growth, close stores and cut costs to protect the bottom line? The time to prepare for 50:50 is NOW. A handful of smart retailers have embraced the in-store disruption and are recalibrating their physical assets to help deliver truly customer-centric shopping. These retailers are investing in creating unique store experiences. Among their efforts, on-floor sales associates receive instant video training, communications and web access via tablets; RFID and beacons − key pieces of the omni-channel dimension − enhance inventory analysis; and in-store analytic and productivity tools help drive traffic, increase conversion, comparable store sales and build customer loyalty. Let’s take a look at four retailers prepared and destined to thrive in the world of 50:50. Each thinks customer first. They’ve repositioned their physical store assets to draw digitally-savvy consumers to an in-store experience that pure-play online just can’t match. They stake customer needs and data at the core of retail; create showcase, experiential stores complemented by virtual extensions of the brand; and deliver exciting in-store technologies that enhance the mobile, visual and customer-centric advantage. 1. Williams-Sonoma launched in 1956 as a kitchen store, started a catalog business, then intelligently leveraged its valuable customer database to identify store locations, consumer trends, needs, interests, preferences and new opportunities. Through smart acquisitions and expansion strategies − for example; Pottery Barn, Pottery Barn Kids and PB Teen, Williams-Sonoma Home, Mark & Graham, West Elm and Rejuvenation − that built on its strengths and knowledge, the company now delivers truly data-driven and experiential store experiences. At the heart is the Grand Cuisine store. Cooking enthusiasts can’t resist this store, even though most everything sold in-store is available online from competitors such as Sur La Table, Chefs and even Amazon. Yet Williams-Sonoma stores are thriving, both as experiences and as profit centers. From the food “samplings” to the elevated and fashionable seasonal visual presentations of appliances, tabletops and cookware to the brilliantly curated gadgets and seasonings, Williams-Sonoma stores feel like a friend’s gourmet kitchen. Need a mixer? A well-informed Williams-Sonoma store associate will demonstrate a mixer, answer your questions and gift wrap it for you. You’ll likely walk out with a matching blender and new toaster oven, just after signing up for the next cooking class. At West Elm, Jim Brett transformed this catalog and chain to Williams-Sonoma’s fastest growing brand by humanizing its products and stores. Associates are encouraged to develop relationships with customers and the community. Store employees are “design consultants”, prepared to assist clients in-home or in-store with decorating decisions. Store events, such as a recent dumpling making class, build store traffic, relationships and ultimately more sales. Customers are hooked! 2. It’s hard to believe that Restoration Hardware once was a typical mall retailer with nearly 100 stores. After exiting most of its ordinary chain store formats and totally “white boarding” a re-entry strategy, the rebranded RH reintroduced itself in 2012 as a luxury home furnishings company. Today the high-end retailer and “disruptive brand” showcases its upscale, curated selections in revolutionary stand-alone galleries, including a former Museum of Natural History, Historic Post Office and other artistic venues, such as the one seen below. RH’s intriguing Source Books, which replaced its monthly catalogs, and the brand’s website serve as virtual extensions and compelling circular tours of RH lifestyle interiors. The strategy proved successful: From an uncertain future in 2008, RH net revenues in 1Q2015 alone experienced double-digit growth to $422.4 million. These results “exceeded our outlook and increased 15% on top of a 22% increase last year,” said Gary Friedman, RH Chairman and CEO, in a recent financial statement.17 Overall results further demonstrated “the disruptive nature of the RH brand and the power of our multi-channel business model.” In addition, RH stock has tripled since its 2012 IPO. “This is not going to be a retail model you can fit into a simple spreadsheet. You can ́t build a simple model of true innovators like Apple, Tesla, Google or Facebook. This is not a lifestyle. Restoration Hardware is a lovestyle”. RH stock has tripled since rebranding and going public in 2012. (September 21, 2015 closing.) 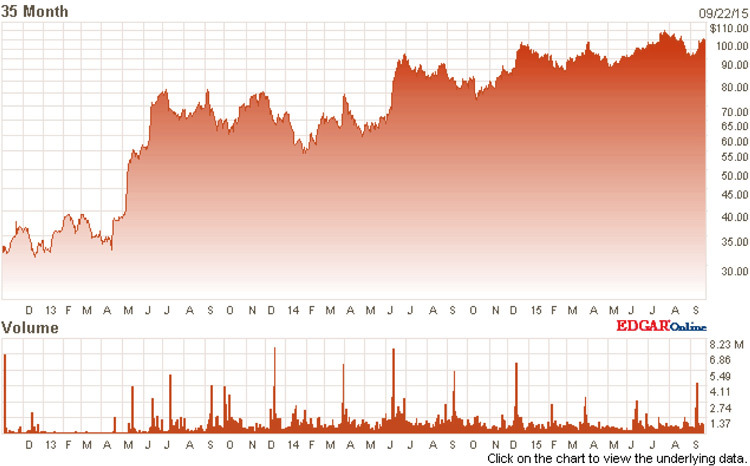 Chart courtesy of Nasdaq.com. RH’s seamless integration of stores, digital and Source Books creates a totally unique business model − one almost equally divided between the three. The stores both inspire and astonish. Customers are encouraged to “showroom,” take photos of inspirations and test the seating on a down-filled sofa. Highly-trained staff decorators and designers nimbly deploy touch screen tablets to aid purchase decisions, illustrate room layouts and check inventory in the distribution center and timing of special orders from suppliers. The entire supply chain and the stores are interconnected. There is no channel here − only Restoration Hardware − with nothing vanilla about it. 3.Neiman Marcus is a legendary luxury department store known for service and delighting its well-heeled customers with extraordinary assortments. With its strong database − derived from an outstanding InCircle loyalty program, catalogs and the recent addition of Mytheresa.com, a global luxury e-commerce company − Neiman Marcus has merged its assets almost seamlessly with its clear command of the physical store. Founded in 1907 and highly impacted by the 2008 financial crisis, Neiman Marcus has emerged as a success story in the new world of 50:50. While the brand always embraced high-touch store service, today there is a renewed mission of engaged and interactive stores. In April of 2014, Neiman Marcus was a leader in retail organization, merging its stores and online teams. NM is already seeing some of the results of this leadership change. New initiatives include a 360-degree Memory Mirror, interactive on-floor merchandising tables, mobile 3-D search and purchase app feature, and other new concepts from the company’s Innovation Lab. These aren’t just shiny new objects, but important pieces to the circular commerce puzzle and are being fully integrated into the store experience. Most are linked to the powerful Neiman Marcus database and sustain the company’s goal of providing customer access to its merchandise anytime, anywhere and on any device in an upscale, personalized shopping environment. In-store, these exciting new technologies combined with customer-centric data and analytics help Neiman Marcus associates enhance interactions with its customers. Currently the company is remodeling more than half of its stores and plans to open its first flagship store in New York City in 2018. An IPO was announced early August 2015. 4. Club Monaco also is leading the way to a world of 50:50. Like many retailers, this company followed a chain store mindset for many years. Just as it has advanced its on-line presence, it has retooled to create an environment in which customers can feel the energy of a well-executed store experience. Features include a beautiful physical space, unexpected curated collaborations, a delightful bookstore, the smell of fresh flowers and scented candles, a coffee bar, and services such as dressing rooms designed to pamper each customer. The engaged staff is well trained and customers, most of whom are digital natives, all seem to enjoy the age-old retail store shopping experience. In all of these examples − William Sonoma, Neiman Marcus, Restoration Hardware and Club Monaco − clearly the definitive pattern is a well executed store experience, driven by data and enhanced by technology. The pattern traverses far from the ordinary mall white box. All four of these retail winners place the customer, not the channel, at the center of the value equation, and all are being rewarded for replacing omni-channel with Seamless Circular Commerce. This trademarked business model − The “O” MethodTM − has replaced omni-channel thinking and its obstructive managerial structure. The new Seamless Circular Commerce ROI engine anchors the customer at the heart of commerce creation. Technology enables and data is the new “currency” of this customer centric ecosystem. The “O” MethodTMTM helps enable a more effective customer-centered organizational structure. Inside the new circular organization design, divergent teams with differing skills and work styles willingly align to address changing consumer patterns. The “O” MethodTM − a new “O to O” business model is needed for the world of 50:50 − one that merges online and offline to circle the customer core − finally allowing consumers, not channels, to drive the retail organization. As a result, the smartest retailers can now measure marketing, process and technology spend in terms of lasting customer engagement and spending patterns, not departmental accountability. When consumers easily can move to their brand engagement and commerce delivery points of preference, companies can continually foster the long-lasting customer relationships that maximize total ROI. Retailers that replace outdated linear processes and failing customer strategies with Seamless Circular Commerce are well positioned to succeed in the disruptive world of 50:50. Some high-profile retailers have “wowed” the media and some customers with novel bell-and-whistle technologies that at first seemed to cater to and digitally integrate customers’ needs. In the end, misguided retailers executed in-store strategies that didn’t connect to nor enhance the companies’ brand, product, mission and end-to-end customer experience. Nor did they truly prepare for the world of 50:50. Kate Spade once infiltrated the media with its pop-up storefronts with windows equipped with touchscreen technology. Passers-by could select from the products displayed and send a text to schedule delivery. But where was the connection to the company, brand and customer experience? But KSS didn’t get it. Every one of its stores closed in 2015. A deeper look into centralized data that reveals what customers want and how and where they want to buy may have saved this retailer. Gimmicks such as a shoppable window didn’t address several of the brand’s underlining issues of quality and service. Another luxury handbags, accessories, footwear and apparel retailer introduced an interactive social mirror display showing videos, social media and inspirational content. The gadget enables shoppers to order drinks, change lighting and request a fitting room. A trail of data is generated as shoppers touch the display. At first glance it looks pretty cool, right? But the cool experience and data collection value stops right there if the fundamental connection with the customer experience isn’t made: At a New York City location, sales service was almost non-existent, the retailer’s associates fumbled with ringing a to-be-shipped transaction; the customer never received a single shipping update or on-line thank you; and ten days later when the package finally arrived, the item was damaged. And it took weeks to become part of the email marketing community to stimulate future business. An innovative technology display alone won’t draw that customer back; it’s one of the many novelties that fails to connect to the vital customer-centric and quintessentially human experience required in the world of 50:50. In the past few years Macy’s invested heavily in an omni-channel strategy that beefed up the bells and whistles offered online and mobile. They have been recognized for their omni-channel “genius” by benchmarking agency, L2. But omni-channel includes the physical store, which must also deliver a terrific shopping experience, not be touted simply as a place to pick up items ordered online. The Macy’s stores disappoint most customers for service and retail standards. The retailer continues to announce 40 additional store closings for 2016. But Macy’s may be getting the message of what will be required for the world of 50:50. This year Macy’s is adjusting certain aspects of store and field operations and refocusing the staffing in each store location to facilitate growth, increase productivity and improve efficiency, according to a company press release.19 Selling service and support is being modified to match business opportunity in each department. The company is restructuring its merchandising and marketing for a better, single omni-channel view of its business, and reinvesting $140 million primarily in technology, talent and business development, the company stated. And the blue mercury acquisition may teach the giant new skills in customer service and product knowledge. Before investing another dime, take a good look at your retail store culture, structure and solutions sets − then consider how you can reinvent your stores to deliver the necessary customer experiences that win in a 50:50 retail industry. Start by respecting the store as a key link to business success – not just a place to make transactions. Place customer needs, wants, activities and preferences at the center of commerce creation. Invest in data analytics and a customer-centric experiential store environment, and utilize technologies that remove customer friction, maximize inventory and enhance sales associate productivity which bring a retail brand to life. Then meld these store experiences with your digital touchpoints to create a Seamless Circular Commerce ROI engine. can help. The O Alliance is a new consulting model that delivers a customer-focused strategy and solution-driven execution to create a circular, successful shopping ecosystem. We work directly with senior-level executives, advising board members and investors seeking to transform their organizations. Our network of practitioners, affiliates, members and advisors are vetted, best-in-class leaders in all the critical disciplines − including digital/technology, operations, change management, marketing and talent − required to unlock value and empower retailers to master today’s changing marketplace. Founded by Andrea Weiss − a former Walt Disney executive and considered one of the best store executives in specialty retail for more than 20 years, she was a pioneer in creating seamless customer experiences −The O Alliance is a unique, transformational retail consultancy with a truly holistic approach. We draw from our group expertise to mold a custom solution set which accurately aligns a retailer’s specific organizational practices with today’s digitally savvy consumer. The “O” MethodTM, previously described, effectively merges retailers’ online and offline efforts to circle the customer core − finally allowing consumers, not channels, to drive the retail organization. The “O” we apply to our brand stands for the circular commerce approach we champion as the replacement for outdated linear processes and failing omni-channel customer strategies. The O Alliance is an advisor to the Board of Directors, a partner with the C-suite, an agent of change, and a hands-on implementation team for today’s forward-thinking brands and retailers. We are experts in creating the essential new Seamless Circular Commerce business paradigm. We have the experience and depth to analyze existing situations, visualize new methods, manage change, eliminate sub-optimization and execute value-creating strategies. We walk clients through every new challenge. Our discerning expertise in uniting new and in-place technologies creates truly efficient circular customer engagement and commerce that maximizes growth for the long haul. • Practitioners with an expertise in the critical areas that empower growth. Hands-on practitioners help execute initial business assessments then assist in creating transformational solutions to the opportunities identified. • Affiliates a growing network of best-in-class technology and service providers that craft the required business solutions. Though fully versed in each solution, The O Alliance remains technology platform agnostic: We match our clients’ needs with the correct solution, working to leverage clients’ current investments in smart technologies and advising on new services and systems. • Members a vetted group of consulting companies with a range of skills required to manage talent, organizational change and productivity enhancement. Members actively engage with each client to assure business success, using The O MethodTM. Our thought leadership and ability to unravel customer-driven retail issues distinguishes us as the trend-setter in navigating retailing’s ongoing seismic shifts. By partnering with The O Alliance, retailer response to ongoing industry challenges is decisive and intelligent. “The wheel is come full circle”.